Did you know that your crawl space can easily be converted into additional livable space in your home? The experts at Liftech can excavate your existing crawl space and provide you a new area for a bedroom, media room, storage room or other additional room you really need and always wanted. With space at a premium and home values across the Front Range continually rising, a crawl space conversion may be your BEST option for gaining valuable space in your current home without breaking the bank or having to move to a larger home. To get started, request a free estimate from Liftech today. Why go through the stress, hassle and cost of moving to a new home if you don’t need to? Liftech can give you the additional room you need within weeks, all while you are still living in your home as we work underneath it! Why spend more money and time popping the top on your home or trying to increase the physical footprint of your home, while trying to live in a war zone for several months? The average cost to build an addition on your home is typically $250 per square foot or more here in the Front Range for a basic renovation. Liftech can convert your crawlspace into a full, livable basement for 25-50% LESS than building an addition on your current home! Why mess with the curb appeal of your home if you already love it? Many homeowners love the exterior appearance of their current home, and a new addition may compromise or ruin its look and character. Unless the ENTIRE exterior of your home is renovated at the same time (think $$$), it is nearly impossible to match the finish of a new addition versus the older counterpart it’s attached to. If you own a Historic Home, crawl space conversions are a fantastic option for adding space when you can’t alter the exterior of your home without jumping through endless hoops. Are you already looking at finishing your basement and have an existing crawl space? NOW is the time to look at the cost of expanding the footprint of your basement for even more room. Don’t compromise on a small, partial basement when Liftech can often double the footprint of your basement giving you the additional room you wanted all along. Each crawl space conversion is unique and will first need a thorough in-person evaluation from a Liftech representative. After determining your crawl space is a good candidate for a conversion, Liftech will prepare a detailed proposal for your project, including an estimate of what your crawl space conversion will cost including materials, labor, engineering and permit fees. We will also provide additional options for moving plumbing & utility lines, HVAC systems, adding egress windows, perimeter drainage systems, or other items you may want or need. Liftech can also refer you to our preferred, third-party basement finishing companies to provide quotes on finishing the space after our work is completed. Crawl spaces are common to allow for proper ventilation under a home, creating a stable “insulated” space between the soil and overlying structure. These are typically excavated 3-4 feet below the surface and under the frost zone. Most homes have a combination of a partial basement AND a crawl space. 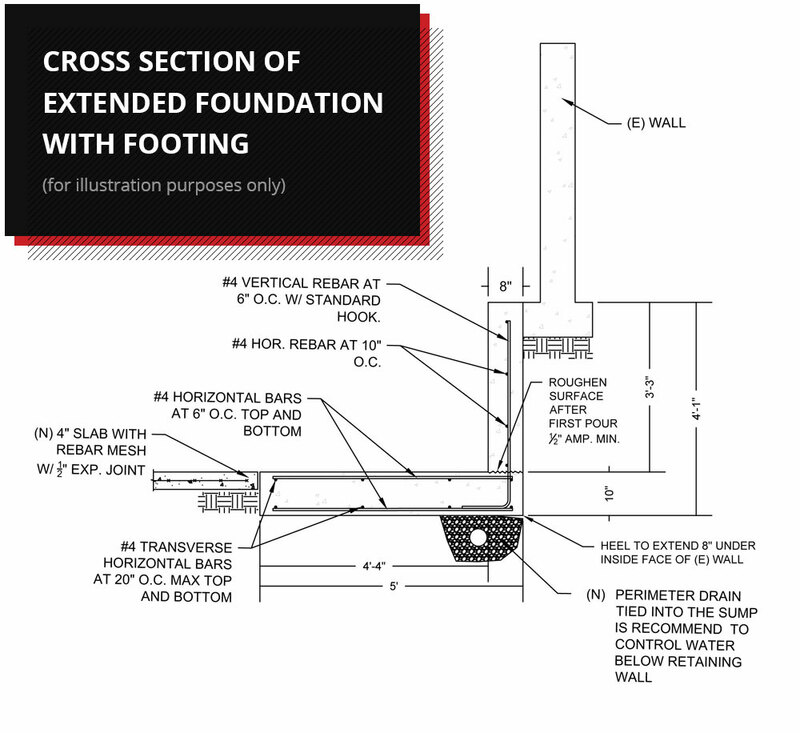 Why don’t home builders just excavate the entire foundation and create a full basement? To save money! But as a homeowner you can convert this area into valuable living space at a reasonable cost. PARTIAL BASEMENT WITH A CRAWLSPACE ADJACENT TO IT. THIS IS ONE OF THE MOST COMMON CONFIGURATIONS IN EXISTING HOMES. After removing the dirt within the crawl space, Liftech will form and pour a new 8 inch foundation wall and footing on the inside of the existing, shorter 3-4 foot crawl space foundation wall. This wall extends downward from the existing crawl space until we reach the desired ceiling height; typically greater than 7 feet. The new foundation wall partially extends upward in front of the existing crawl space wall to strengthen it and maintain its structural integrity. THE SOIL UNDER THE OLD CRAWL SPACE HAS NOW BEEN EXCAVATED AND AN EXTENDED FOUNDATION WALL HAS BEEN POURED (OUTSIDE VIEW). After the new, extended foundation is completed, Liftech will pour a new concrete floor in the newly excavated area and your new space is ready to finish to your tastes! WELCOME TO YOUR NEW, FULL BASEMENT! STORAGE SPACE IS ONLY A CALL AWAY!